tl:dr ? Jaundice is very common (60% chance), and Singapore doctors will run multiple blood tests until the jaundice level is low. __Unfortunately, __my baby had to take 11 blood tests before being considered ‘safe’. Day 18: Detailed blood test at Polyclinic. Direct Jaundice 6, indirect Jaundice 178. That’s a total of 11 blood tests in 49 days! Blood Test #1 and #2 were done in Mount Alvernia Hospital. After being discharged from hospital, we went to Yishun Polyclinic to have a routine checkup. We had Blood Test #3 on Day 5, which is also the peak of jaundice level. Turned out Kate’s jaundice level was 291, the highest recorded in this jaundice episode. As the guideline (KK Hospital’s guideline to management of Jaundice) is to admit to the hospital if level is above 300 on day 5 (which is also the peak of jaundice), the doctor advised us to send her to KK Hospital immediately, since the level is very near to 300. I have nothing against the doctors (from Yishun Polyclinics or KK Hospital). They are following the “guidelines”, and making sure Kate is fine. As one of them said, they are being kiasu (playing safe). I asked if the condition is critical (answer is no), and if there are alternatives. I go for option 2, and started to research on the topic. Babies are classified high risks if having conditions such as blood type mismatch between mother and baby. Kate is classified as normal-risk, and she is exclusively breastfed. Therefore, it is more likely she has “breastfeed jaundice”; less likely that her liver is malfunctioning etc. I prefer to “wait-and-see”, with the hope that the jaundice will go down. The downside is that TIME & BLOOD are wasted. In the first 18 days alone, 9 blood tests were performed! That adds up to a lot of blood! And she cried most of the time when being pricked. Moreover, every visit to the polyclinic, my mother and I will spent an average of 2 hours waiting and traveling. I felt very very sure her jaundice is caused by breastfeeding, and will go off gradually, and not likely to have any brain damage. But my wife and family were worried, therefore we still stick to doctors’ advise as much as possible - to keep monitoring if we don’t want to send to hospital. On Blood Test #5, when doctor scheduled yet another blood test, I gave up. I got tired of going to Polyclinics repeatedly for blood tests, and seeing Kate cried when being pricked. It is unlikely the level will drop to below 100 soon. So we sent her to KK Hospital for phototherapy. Why I don’t like hospital? I am against sending Kate to hospital because the risk is low. Hospital is unlike home. The nurses were nice, but when baby cries, they will not handle immediately. Definitely less love and attention compared to home. But phototherapy is effective, and it dropped to 204 after 24 hours. After being discharged from hospital, the doctor scheduled for another blood test the following day.. We didn’t go, because I am very sure it would not have dropped to an acceptable level that quickly. We waited for 5 days, then had the Blood Test #8. The result is 190, which is still high. No prize for guessing – the doctor scheduled for another blood test. Blood Test #9 is different. It will test for Direct Bilirubin level, which will indicate if the liver is ok or not. To do that, much more blood has to be extracted this time - around 30 drops of blood, drop by drop.. The result: Direct bilirubin level is 6, which is lower than the abnormal level of 10. So her liver is okay. I thought that’s good news and no more blood tests. But, the doctor advise we come back 1 week later to take another blood test. He said jaundice have other causes such as urinary tract infection etc. By this time, we were quite sure Kate is fine since the direct bilirubin level is low, and she is no longer yellow. For Blood Test #10, a big tube of blood (around 30 drops again) needs to be extracted because the baby is now 1 month old. Kate always cried out loud when so much blood must be pressed out from her foot. The level was 146, and I felt like I have missed lottery by a bit.. It is a big waste of blood, for nothing. To be sure we can get to the ‘safe level’, we scheduled the next test 2 weeks later, and at last, Blood Test #11 is 56! ‘Safe’ at last! We can finally get doctor’s memo and successfully buy (Aviva) insurance for baby! Hooray!? If I have a another child with the same jaundice situation (normal risk, breastfed), I will handle differently. So this is actually also advise for my future self. Repeated blood tests are huge waste of blood and time. Take doctor’s advice and make your own judgement. For example: If the level is 200, and doctor ask you to come the next day, it is unlikely it will go down to level 100 over night. So.. don’t do unnecessary blood test. 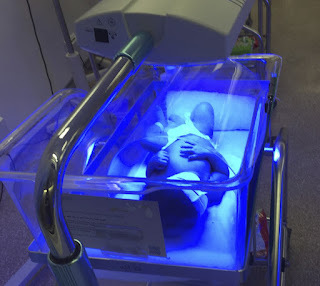 To bring jaundice down, home phototherapy under the sun would help. Just make sure the eyes are covered. If the jaundice level is high and longer light exposure is needed, you can rent phototherapy equipments (around $300 for 2 nights) in Singapore, such as this and this. I wish I tried renting first. Hospital bill already cost $700 (although with Medisave), and hospital is not nice. After day 14, if the level is still high (but not critical), then it is likely breastfed jaundice. As such, ask the Polyclinic doctors to do a detailed blood test to test if liver is functioning well or not. It is also quite obvious to “see” jaundice. When jaundice is high (above 200), the eyes will be slightly yellowish, and skin tone is darker. I hope Singapore health authority would revise their guidelines to management of jaundice. This happened too many times, not just to our baby. Too much blood, time and money are wasted. And I hope insurance companies will review their protocol and not reject a policy just because of prolong jaundice.